Shooting Bigfoot (The Frank Cali Interview) and Shooting Bigfoot Researchers! Of course we called that as a hoax before even embarking on the trip as we did his tent video and new dead body claims for the last year. Since our coverage began of the Bigfoot Body Hoax Part Deux, we’ve seen Dyer falling apart piece by piece as we’ve and others like Racer X, have predicted. Last month, as he has done in the past made an exodus from the scene yet again, because once again he is using the excuse his family is being threatened. We’ve also seen quite the exodus, again as predicted, from Team Tracker. We’ve seen more Vice Presidents (DJ Brashear, Cindy Schaefer, Chris Sands and now Frank Cali) not since the likes of the Nixon administration in a rotation of resignations of Vice Presidents and citations of illegality, immorality and down right mean spiritedness, by the expatriates. One of the most vocal and outspoken, has been probably one of the closest to Dyer is Frank Cali. I had an opportunity to ask Frank some questions in written form to him. 1. How did you end up becoming VP of Team Tracker, what did Dyer promise in terms of money? 2. What were some of the first signs you saw that Dyer was making the whole thing up? “Dyer had told the entire team and people who listened to his radio show I was coming on the week BEFORE then to see the body. What he wanted to do was to get talk going among people that I was there and had seen it. I had seen nothing. The next week I flew to Vegas at my own expense. That night I didn’t say a word waiting to see if he really was getting me "in" to see the body. Dyer announced to everyone and said "Frank, come in, we have someplace to go"
We got in the car and he drove me to a fast food place 10 minutes from his home and he ordered ICE CREAM" and eat it in the car. He told me that he could not get me in to see the body and that he was having a reproduction made of the body to take on tour. 3. When Dyer tried his "California caper" was it apparent to you as it was to us, that he never expected to have someone call him on it? Yes, he never thought you or JR Dobbs would come. He kept me in the dark right up until the last minute on that one. 4. Did Dyer ever confess the whole thing was a sham to the Team Tracker Execs or was he also playing them as well? No, He never told me or anyone else that I know of the truth. He would lie to me about all kinds of things and it must made me mad that he thought I was stupid considering back background. To this day, he still has never told me that he didn’t move to Utah. When he claimed the "investor" told him to move due to the made up threats, he said they gave him $100,000 to relocate for safely reason. I knew he only moved a short distance from his other home in Vegas. 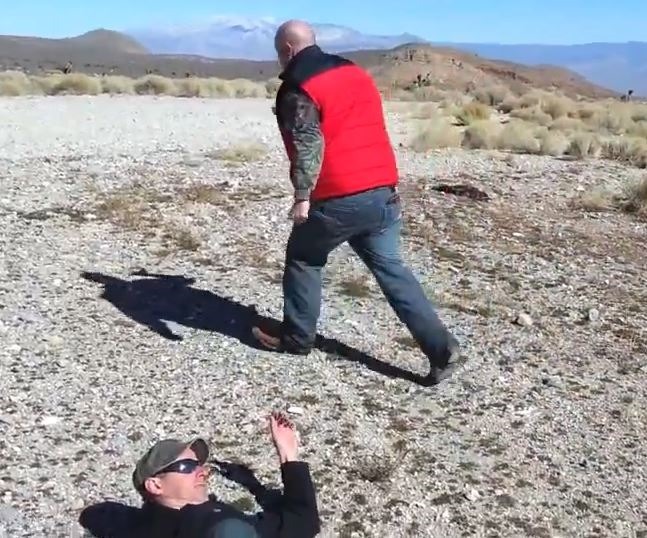 One very important thing was I pressed him to release the video of this "Dead" Bigfoot to the public as he called and said he needed $6,500 to get the trailer done that he was getting made to transport the body. I said to him "Well, you have the greatest video of all time. Why don’t you release it and do it tonight. That should get you the $6,500 you need. He promised that I would get to see it, but I never did. The biggest thing to make me say was it’s time to leave was when he called me again and said he need another $6,000 for another trailer and the one being built allegedly was sold die to him missing the final date to the payments. I asked him what happened to the money he got for the DVD’s "After the Shot". He said "Well, I got to eat" and it’s spent" That when I deceased that was enough. I had been on his show saying that he would release them when he hit the 100 mark. When he never said showed me the footage. I told him that I could not do it anymore and I stopped doing the show that night. A few days later he called me on a Sunday morning at 10am eastern and said he was up all night and that he already had announced that he was stepping down to devote full time on the tour and I was now "President". I have been around for a long time and had seen just about everything. For sure when I worked In DC. I knew then for sure that he was going to try and hang me out to dry and blame me for everything. I was smart and never had any money to do with him ever sent to me. Anything anyone paid also always was sent direct to his PayPal account which now has been frozen due to so many people taking my advice and asking for their money back. PayPal now has the authorities investigating him and his actions. 5. Can you name the folks whom Dyer seemed obsessed over and some examples how great his obsession was? Yes!. He was most obsessed with you Racer X, Michael Merchant, Shawn Evidence, Justin Smeja. Now he’s turned his attention on former Team Tracker people such as myself. Dyer has also tried to trash the name of Dallas Gilbert and Tom Stickle, another former team, member. All of what Dyer says and writes about them is a complete lie. 6. Did you ever meet Lilly (Rosa) and if so, did her relationship seem normal with Dyer? Yes I met her when we came to Vegas for the Mt Charleston trip. I have heard a lot of bad things about that relationship from people. Also someone close to them has heard her telling Dyer he better get that body made soon. 7. Dyer appeared to have a bit of a sadistic streak. Can you give me some examples of such and can you support of dispel any rumor of Dyer being a drug user? I believe he his bi-polar and also a pathological liar. He lied to me every time he called me. Still to this day, he has never told me the truth that he told me that he moved to Utah I knew he was only moving to another place in Vegas. The home he has now they say is "Section 8" housing. I never seen him use drugs, but most of the time he would call or if I need to call him during the day, he sounded like something was not right. I asked him many times if he was ill and he said no. But he did sound like he was under the effects of something not normal. low, very draw out speech and sounded like he was allegedly on or doing something. There were times when I would talk to him at 6pm and he sounded messed up on something and then a few hours later that same night when he did the hangout, he appeared fine. 8. 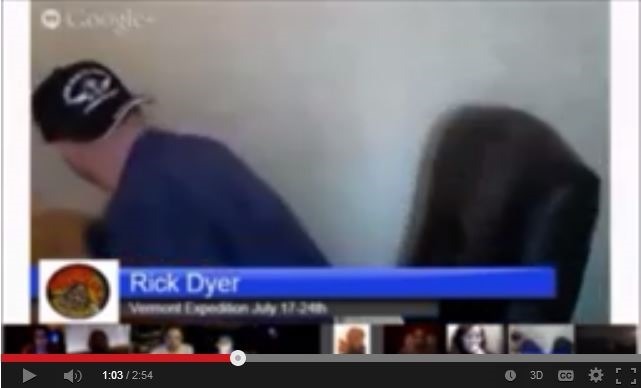 What really happened when Dyer got caught with the drugs behind his camera that one broadcast? Did he ever fess up? He tried to burn the award he was given by Facebook/Find Bigfoot on that dresser. It caught fire and someone told him to run and get salt to put the fire out. Here is a "grown man" setting to something in his home with his wife and 3 small children in it. Just recently he did a video on his YouTube channel making fun of a "person" who allergy makes him act like he’s on the drug cocaine. He got all the gestures right on the button. I have a relative who is retired drug enforcement and had him watch the Dyer video and he said "He does a great impression for someone who claims he don’t do drugs." 9. Aside from his sales through memberships, and DVD’s has the Dyer had any real private investors aside from FBFB? Is it true that Dyer claimed that FBFB bought his rifle? He does claim to have "investors", but I don’t think he has anyone at this time or in the past year. He did sell FBFB a gun for a huge amount of money. The thing that got my attention and I have told this to them is when I would write about that gun. Dyer would always say "make sure you say it was a gun SEEN" in the movie "Shooting Bigfoots". Do Not say "It was the gun USED to shot the Bigfoot" . A lot of alarms when off when I heard that. 10. Does Dyer have any thermal equipment or sold any thermal equipment? He did have 2 FLIR camera on loan arraigned through FBFB. He held on to them for some time pretending that he was going to throw them out. he even posted a photo of the 2 camera’s setting in front of a greasy pizza box as garbage. He now claims he sent the FLIR’s back. But as we all know, you can believe anything he says. I do hope he sent them back. FBFB was very kind to arrange for him to have these very expensive camera’s on loan. 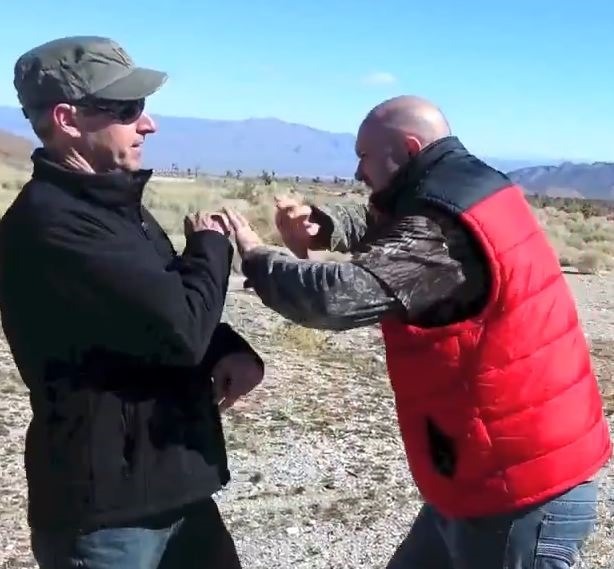 I now know for a fact that Morgan Matthews has never with Dyer at the time of the claiming he shot the tent video. There was NO Bigfoot recorded with Dyers cell phone with Matthews present. 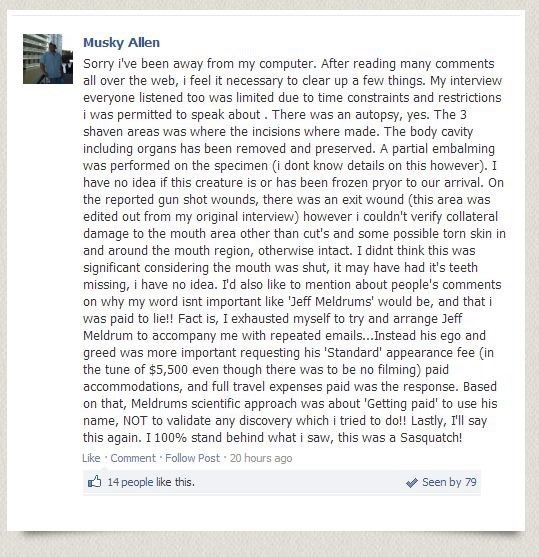 Matthews believes that as is seen in the end of the movie "Shooting Bigfoot" he was ‘attacked’ by a man in a suit. Morgan Matthews will not make this fact known while the movie is in its general release. Then there is the DVD sales and then the pay-per view . People must remember that it’s called the motion picture industry. Like another industry, the main concern is profit. Think for a minute; IF there was an actual Bigfoot filmed during production of that movie. It WOULD be in that picture. That would be a gold mine for any studio. I do also believe that Matthews i snow sorry it got involved with Dyers and his lies and Rick Dyer may destroy Matthews gold reputation in the movie business. Word now is that Matthews has canceled his scheduled appearance in New York City this coming November. I feel he does not want to have to answer any questions in regard to the lies Dyer has been saying about he film for this past year. I encourage anyone who bought the DVD "After the Shot" and or "The Autopsy to has for a total refund as about 17 or so people have already done. Here it goes… the story we’ve been waiting for when two hapless “researchers” go into the woods with guns to “Kill themselves a Squatch,” and one ends up getting shot in the back by the other, luckily nothing life threatening. Both contestants were carrying, but the one shot was a felon, (Contestant Number Two), which is generally frowned upon by law enforcement. SO despite being shot…Contestant Number Two is arrested also! Contestant Number 2: Will no longer be taking “point” on future missions. It seems the wife of Contestant Number One (Daughter of Contestant Number Two for those keeping score), lied when questioned by the police, thus becoming Contestant Number 3, making it (as you hockey fans would call) it a “Hat-Trick” for the local constabulary. Here’s the story in all it’s glory. Rogers County Sheriff’s Department arrested three people in what appears to be an accidental shooting. One of the men told deputies he’d shot his friend while the two were on a Sasquatch hunting expedition. The two men were hunting – apparently for Bigfoot – around 177th East Avenue and Tiger Switch Road Saturday night. Omar Pineda reportedly heard a "barking noise," jerked and shot his friend in the back, authorities say. "When you start off with an explanation like that, do you believe anything after that?" Sheriff Walton said Sunday morning. The men met emergency responders at a QuikTrip near Interstate 44 and 161st Street. The wounded man is expected to survive. 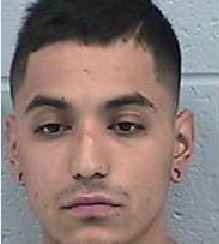 Pineda, 21, was arrested for reckless conduct with a firearm and obstruction. 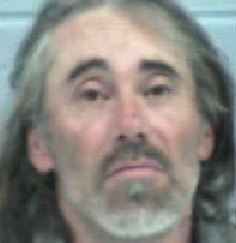 Deputies also arrested Perry Don James, Pineda’s father-in-law. James threw his son-in-law’s gun in a pond on the property because he is a convicted felon and was afraid to have the gun on his property, the Sheriff said. James, 53, was booked on complaints of felon in possession of a firearm and destruction of evidence. The shooting victim was also carrying a gun, though he dropped it when he got shot, according to a news release. That gun has been recovered. 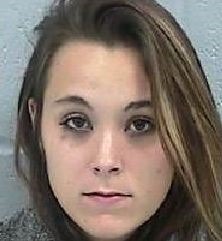 Deputies arrested 22-year-old Lacey Jane Pineda, Omar’s wife, for obstruction because she told police at one point that someone else had shot at her husband and his friend, according to RCSO. Walton said the incident is still under investigation. Authorities haven’t yet determined whether drugs or alcohol were involved, he said. "It probably was an accidental shooting," Walton said. "Our efforts now are to locate the weapon that was used." 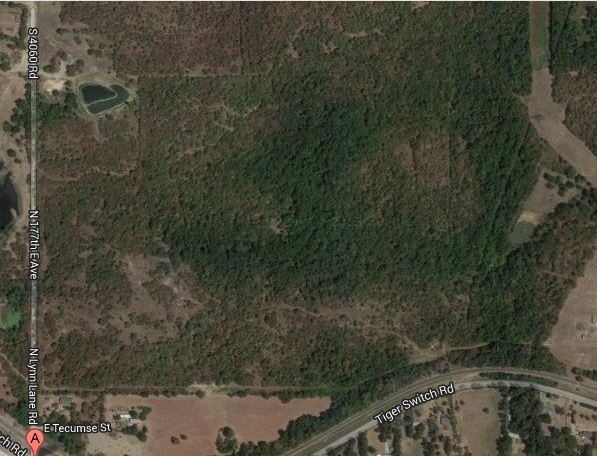 Sad thing is the area they were on the “hunt,” actually looks pretty damned good for Squatch activity. Whoops was that video supposed to be public…well it is. Again with the limited information at this time, it’s hard to state in what context it was taken. 2. 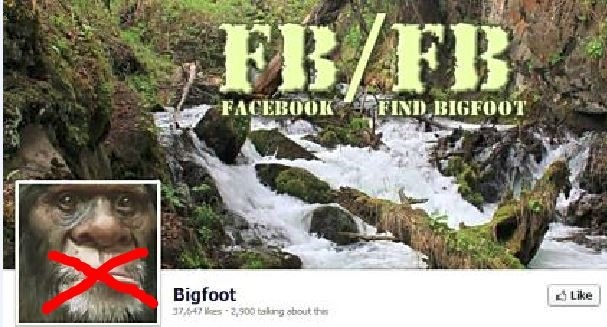 More interesting Dyer makes the claim on 2/11/13 to FB/FB founders, the Bigfoot he allegedly shot knocked down Morgan Matthews. Now there’s a good question to ask the fine director! See a little problem though. An 8 foot Squatch pushing someone like that would not be getting them in the chest, but rather the head, and let’s not forget that Matthews would be holding a camera. We know this because Dyer on February 21st, 2013 flew to Minneapolis and called the person knocked over the “camera man.” He also handed over two shell casings to FB/FB claiming them to be the spent cartridges of the alleged kill shots. This is in direct conflict with his original story, where the camera man was directly in front of the Sasquatch when he shot it. 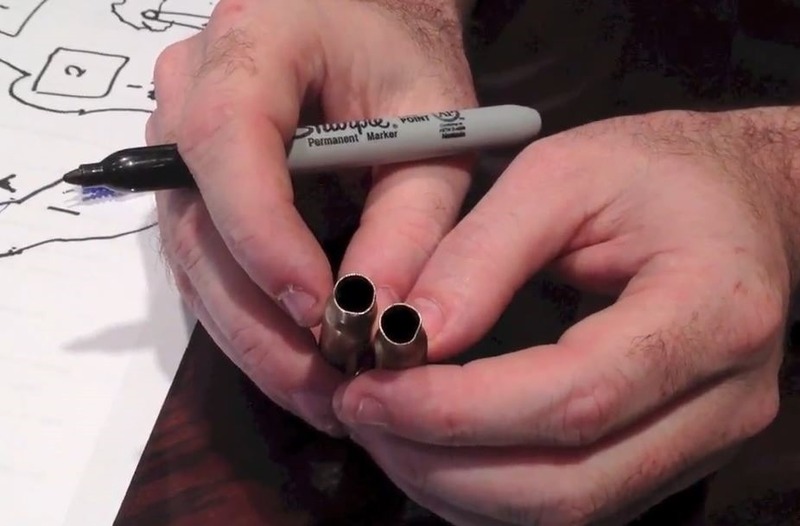 In this very blog we spoke of how irresponsible of a shot that would have been. Now if you listen to Dyer’s story, on the 11th, he states Matthews was in his tent, because he opened the tent flap. Then Morgan tries to grab the gun. But in the Rick Dyer sanctioned recreation, you have Dyer standing barefoot, in his boxers, taking a shot at the big guy with no one next to him. And remember in the original version this occurred in the morning! And the lighting in the original video, indicates it was DAYLIGHT!!! It’s in color, and night vision doesn’t shoot in color. And what would Matthews be doing in Dyer’s tent at night, (especially when Dyer is in his skivvies as illustrated) when Matthews allegedly had his own tent? Dyer illustrating the two tents on 2/23/13. 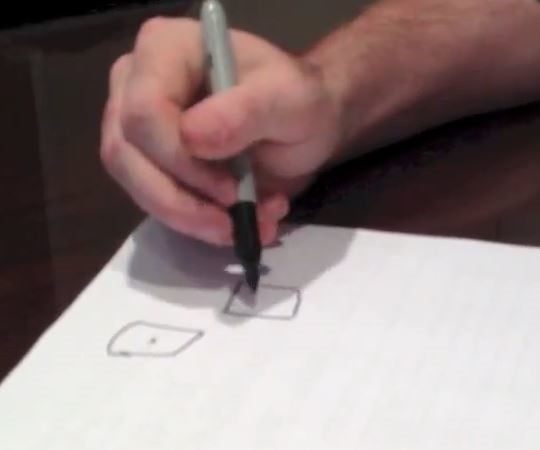 True to a made up story, Dyer forgets that on the 11th, he stated Matthews opened up his tent, as his illustration shows his tent (1)and Matthews tent, pictured here as he is labeling it. Now add this to any lack of evidence that Dyer was with Matthews in September 2012, remember the video clips he showed us was from 2011, by his own admission. Well if stats say anything, it paints not a pretty picture, although initially it caused a spike in their views and subscribers, the views have dramatically dropped off. There “Authentication” video with sound and the voice of Morgan Matthews comes in at #17 with only a little over 3K views. On that page the authentication video fairs a little better, but there’s only fifteen videos listed to this account, versus 160 with the other account. Now in the last box, we understand for some reason his stats do not show up for his live broadcasts, but they are ranked by most views. 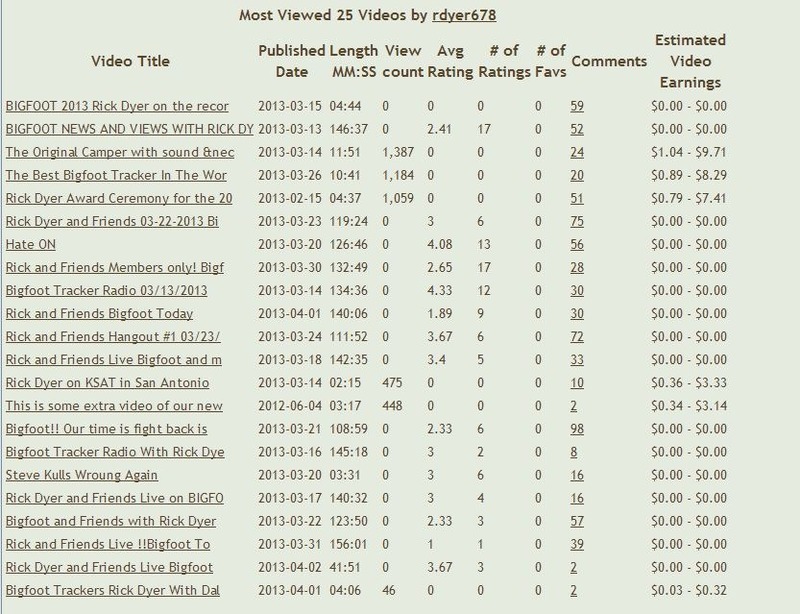 The number 3 video, (a repost of the “Authentication” video) only comes in with 1387 views. Even Tim Fasano’s YouTube page fairs better than Dyer’s, more matter of fact it appears to do better over the long term than FBFB. 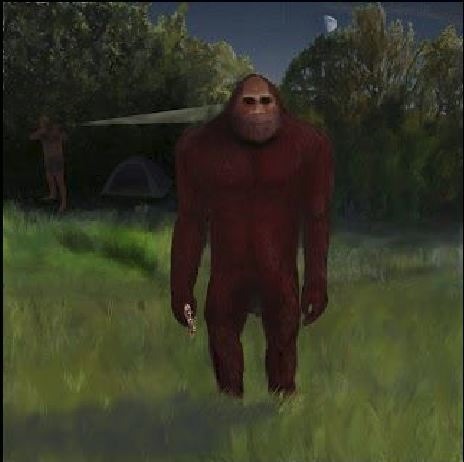 The last few days, since the turn of events in the Musky Allen – Rick Dyer saga over yet again another claim of a dead Bigfoot has taken a series of turns which make things appear, that life is truly stranger than fiction. (Left) Issleb, with (Right) Dyer. As it turns out this appears much like comments from the body propagator, and it is completely false. You see folks I know, Dr. Meldrum’s appearance stipend and it is not so grandiose as claimed. Matter of fact it isn’t even close. A “partial embalming".” Can someone please explain that to me? The circulatory system is a complete system, please explain how you only let some of the blood out and put part of the formaldehyde in? How does that work? Something stinks and it isn’t a Sasquatch body! There was also a comment made by Issleb that he flew home to Chicago. Again our sources, and by his own admission, he resides in Wisconsin. 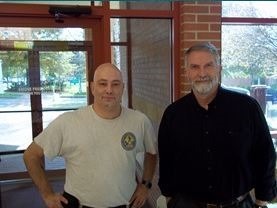 Dr. Meldrum and I at the East Coast Bigfoot Conference in late 2011. 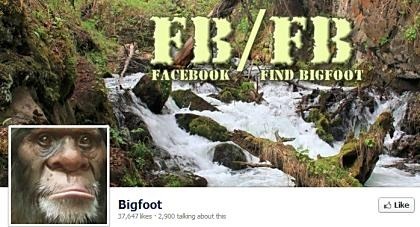 Now… lets take a look at another Pro-Bigfoot group that has come forth over the last couple of years; Facebook FindBigfoot. The Facebook group run by Jack D. Barnes. Guess what? That’s not his real name either. It’s a pseudonym. In September, they were propagating the Stacy Brown footage, much to the dismay of Stacy, as he had asked to keep it under wraps. The release of the footage they stated they had promised us was in actuality the Dyer Tent video, as you can read my previous blog entry here. The fact of FB/FB’s strange behavior around these events are leading me to suspect what some in the community are already saying, that they too may be involved. I may suspect it, but the evidence isn’t quite in yet on that one, and maybe just in their amateurish nature, they have committed to a course, and their ego’s demand they stay upon it. 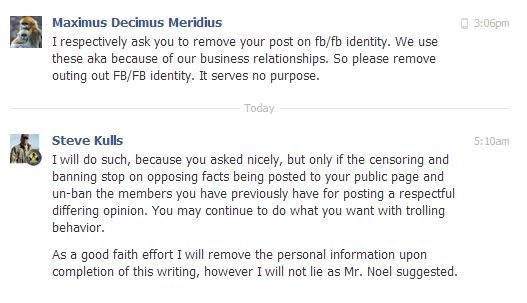 Now in similar fashion, as we’ve seen with other hoaxers, including Dyer himself, FB/FB has made a statement that many are construing as if Dyer does not have a body, FB/FB will shut down. What they said if there is no further evidence. Not evidence to support Dyer’s claims. It’s a little vague if you ask me, and as we have seen in the past with folks like Linda Newton-Perry and her promise to shut down her site, Bigfoot Ballyhoo, don’t expect it to happen. I’d like them to follow through in their promise, however I don’t expect it, and there would be a litany of excuses as to why the promise was not made good on. Also there is a big contradiction in the testimony of Dyer and the testimony of Issleb on what was seen versus what had occurred. The whole shooting doesn’t appear to add up to me and sounds a bit far fetched. For example, Dyer claims after he shot the creature in the back, it runs and he gives chase. A camera man gets in front of the creature and he shoots it in the back of the head, and the exit wound exits via the mouth. Well isn’t that kind of stupid taking a direct shot of something with a camera man caught in the crossfire? And if the shot exited through the mouth, why wouldn’t the camera man been hit? Issleb’s testimony, is again not scientifically correct, (which should be for such a “well respected skeptic”) and contradicts some of the things Dyer states had occurred. An exit wound through the mouth would have been catastrophic and noticeable, mouth closed upon examination or not. There would have been a fair amount of swelling and disfigurement. Thanks to Bruce Barraclough, we have the links to the interviews. 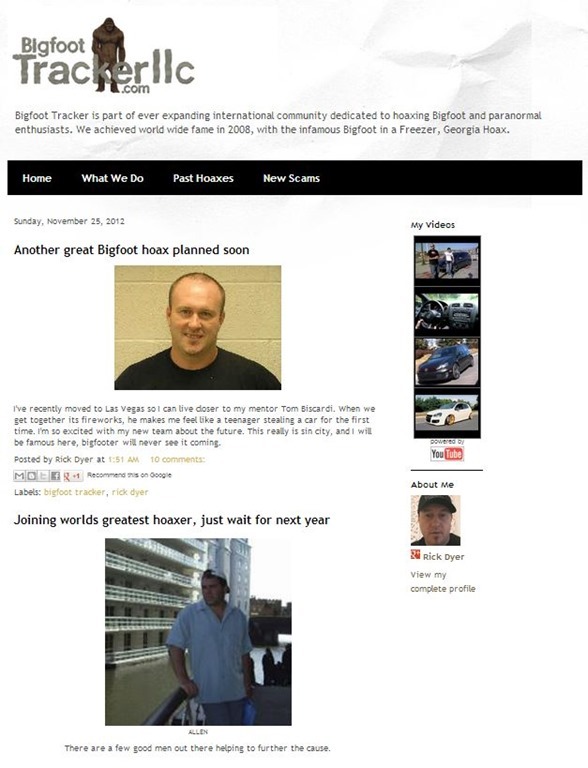 Thanks to Matt Knapp and also Larry Wentz for pointing out BigfootTrackerLLC.com, and thanks to all the other contributors, the list is getting way to big to list them all now!!! Whether this is a real spoof site or not, they identify Musky Allen, using his real first name, which many did not know, REALLY was. The interesting thing is site spoof or not, identifies Musky, (Issleb), and uses his real first name. Some researchers thought that Tim Mitchell was really Musky Allen, but that is incorrect. Mitchell appears to be someone as Cindy “Pinkfoot” Shafer is, caught in the belief and entrenched that Dyer’s claims are real. I wouldn’t read much into the site, it does appear to be a spoof and someone’s disgust and anger over this strange diversion to real Bigfoot research. But as to the people making the big claims, it would seem that the house of cards is crumbling. This often occurs when things are just, made up. Players reveal themselves, and more inconsistencies arise as more players get involved, as well as more outlandish claims.